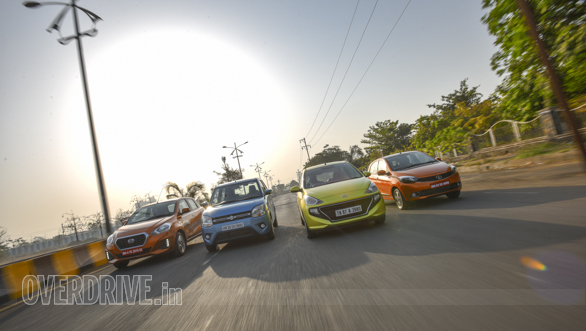 There's been a sharp rise in the number of SUVs getting launched in the country over the past few years, but that has not taken away the fact that small cars still bring much-needed volumes to mainstream manufacturers. And after what I'd call a bit of a lull, the small car segment is back in action, and how! 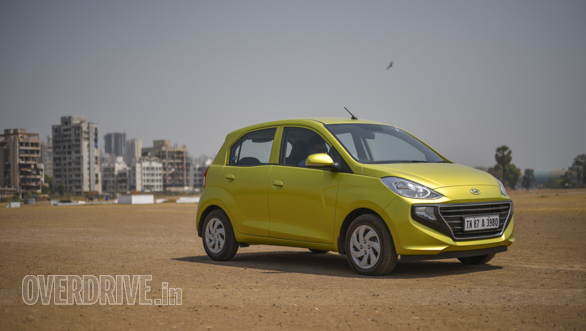 Hyundai brought the Santro nameplate back recently  the hatch that made it a household name, and the Hyundai Santro even won our last comparison test wherein we compared its AMT-equipped version to its rivals. But now with the all-new Maruti Suzuki WagonR having just been launched we felt the need to revisit the scoresheets, this time with the cars' manual versions. We decided to throw the recently updated Datsun GO into the mix too apart from the new, feature-rich XZ+ variant of the Tata Tiago. Let the battles commence! The WagonR has been around for over a decade and has always adhered to the 'tall boy' design, like the Hyundai Santro. These two are the oldest names here considering that the Tiago and GO are both relatively new though ironically, the Santro and WagonR are the newest cars in this test! That said, the Tata Tiago is still the best looking car here. It's low slung stance and short overhangs make for a sporty appearance in conjunction with the blacked out headlights (only car with projector beams in this test), sharp design of the rear view mirrors and low overall height. The GO is a more conventional design and the facelift it received recently helps it look slightly better, especially from the front, but overall the car isn't particularly striking to look at. The Santro on the other hand has a slightly quirky looking face, almost as if it is grinning wide and baring its full set of teeth! It does look appealing though - especially from the sides. Its rear half also reminds of the old Santro, a design that has aged well. The WagonR's design is more of an evolution of what its styling has always been, which makes it instantly identifiable. I like the design of the headlights and grille and the overall sense of familiarity is welcome too. The WagonR's rear looks quirky though  it looks a little too large, almost like a micro-MPV, while the tail lamp design gives the vibes of it being an electric vehicle. 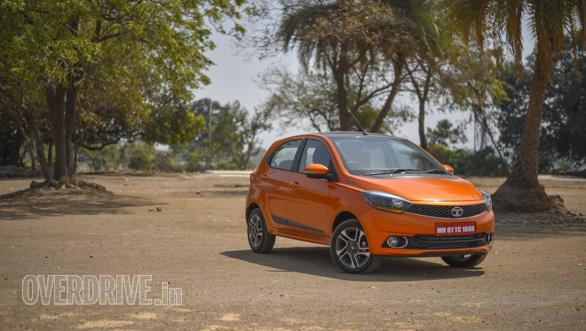 The Tiago boasts a more solid build quality than the others and in fact it is the heaviest of the lot which has a few drawbacks, but the heft helps it offer a safer feel, inside out. 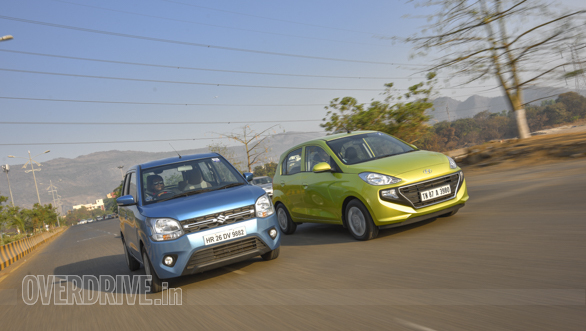 The Santro isn't far off in terms of a solid feel, followed by the WagonR. 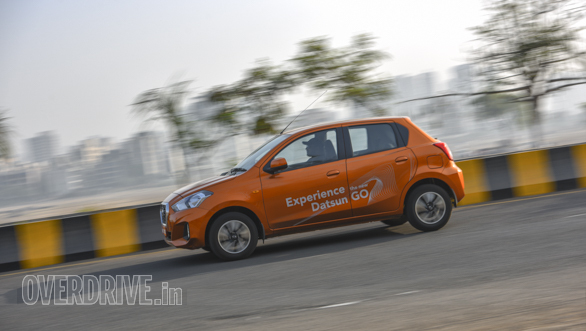 The Datsun GO simply does not feel as solid as the others and even the quality of plastic used for its bumpers leaves something to be desired. Being the newer cars the WagonR and Santro both boast modern-looking, spacious interiors and offer a premium feel. In fact both are neck to neck in terms of interior design and appeal. Body coloured highlights inside the Santro add a dash of sportiness and its green-hued seatbelts look like they belong to a sportscar. On the other hand, the WagonR goes the classic way and uses a two-tone, beige-black colour scheme for the dashboard which also looks appealing. While the Santro's touchscreen and central AC vents use the typical Hyundai layout. 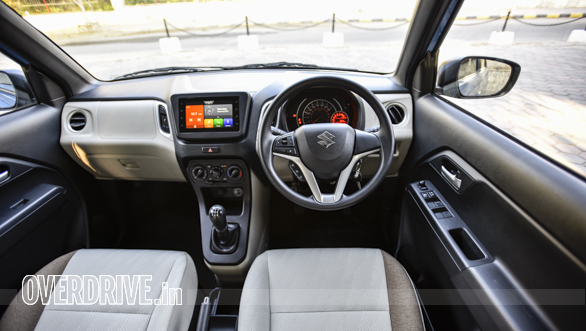 The WagonR's layout looks better though and its infotainment screen also has a more premium vibe. The hexagonal pattern on the Santro's seat covers looks nice, while the WagonR seats are covered in beige fabric. 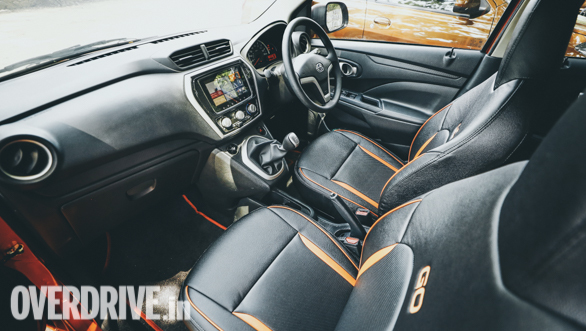 The Tiago's all-black interiors have an air of sportiness but its insides lacks the premium feel of the Santro or the WagonR's cabin. 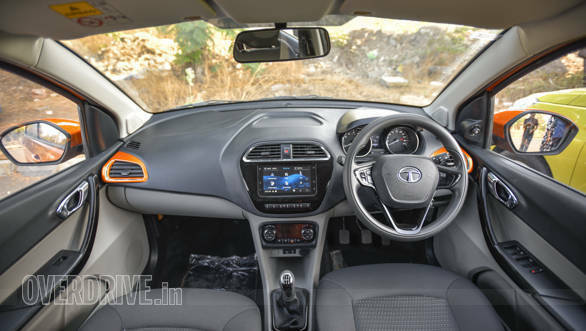 The Tiago's interior layout is also more cluttered, apart from it having lesser cubby holes. Its centre console also looks a little dated, especially in the company of the newer cars here. Quality of plastics is good, though some of the plastics have a few rough edges. The updated GO's interiors look vastly better than the original car and the large touchscreen does a lot to uplift the cabin's appeal. However, plastics and surface finishes are still not on par with the others and the plastics still seem to bear the brunt of cost-cutting exercises. The steering wheel isn't as nice to hold too and in fact the GO is the only car to not have steering mounted audio controls. The centre console mounted gear lever could have been shorter in length as it feels a little too close to, though the GO's driving position is reasonably good. The Tiago's driving position had me fidget a bit before settling down and it isn't easy to find a sweet spot. The Santo's driving position is a lot better, but neither can you adjust seat height nor can you adjust the steering wheel, and I almost felt like the wheel was in my lap! The WagonR has the best driving position, as it feels roomy and also offers a good view, apart from offering rake adjustment for the steering. 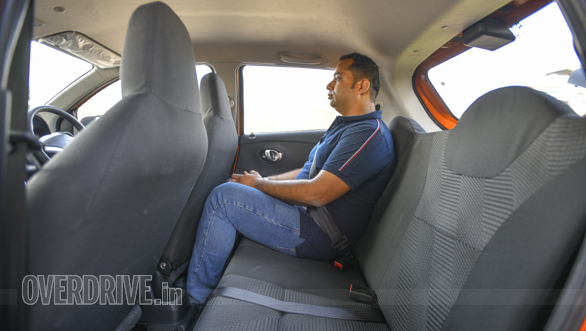 The WagonR is not the widest car here but is the best in terms of rear legroom, kneeroom and shoulder room. The Santro isn't as impressive in terms of back seat space though and feels cramped in comparison. The GO benefits from its longer wheelbase and offers good amounts of legroom as well, but the Tiago isn't as impressive and the black interiors rob it of a sense of spaciousness further. To its credit, the Tiago does have a spacious boot. That said, the WagonR offers the maximum amount of luggage space thanks to its bigger dimensions. 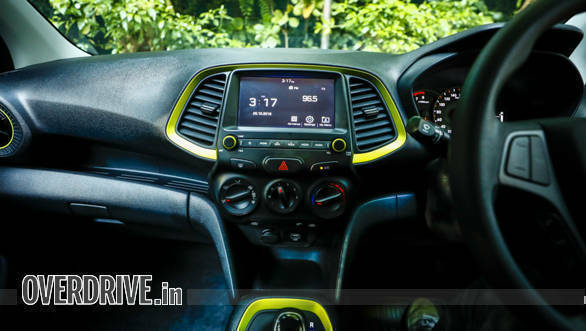 All four cars are equipped with touchscreens for the infotainment systems and the WagonR, Santro and GO offer Apple CarPlay and Android Auto connectivity both, while the Tiago only offers Android connectivity. The Tiago is the only car to offer multiple driving modes (standard across variants). The Tiago is also the only car here to come with automatic climate control, though it is on offer only on the top variant and also gets a cooled glove box, should you choose either of the top two variants. The Santro is the only car to get a reverse camera, while the WagonR, GO and Tiago all make do with parking sensors only. 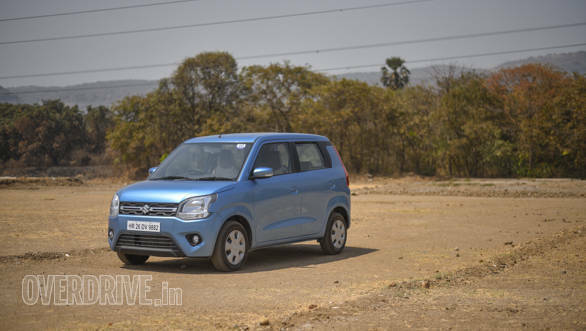 The Santro though loses some of its edge in terms of the safety equipment. It only gets a driver-side airbag as standard and only the top of the line Asta variant gets dual airbags. Dual airbags are standard are standard across variants in the GO and WagonR though. Driver and passenger airbags both are optional in the first three variants of the Tiago, which is a letdown and only the top two variants gets dual airbags as standard. The WagonR is the only car to get an external boot release switch, which adds to convenience. The Datsun GO and Tata Tiago use triple cylinder engines while the WagonR and Santro both use inline four cylinder engines here and except for the Santro which uses a 1.1-litre engine, the other three cars are powered by engines displacing 1.2-litres. The four cars stack up interestingly in terms of their outputs too. The Tiago is the most powerful (85PS and 114Nm) followed by the WagonR (83PS and 113Nm), while the Santro (69PS and 99Nm) and Datsun GO (68PS and 104Nm) sit close to each other lower down the order. However, the Tiago is over 150kg heavier than the others which affects its performance and in fact the Tiago was one of the slower cars in our acceleration test. The WagonR clocked 12.2 seconds for the 0-100kmph dash and was quicker by 3 seconds or more to the other three cars, which is a huge gap! The WagonR is also quickest in terms of in-gear acceleration, thanks to its light weight and the fact that its engine is the quickest to build revs. The Tiago turned out to be the second quickest, taking 14.9 seconds to clock 100kmph  its outputs being the highest helps, but its weight slows the car down. 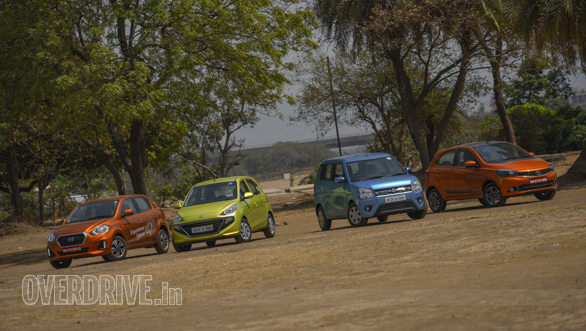 The GO slots in next, clocking 15.5 seconds, while the Santro was the slowest at 16.6 seconds. All four cars are impressive when it comes to engine refinement though with all four engines feeling smooth and vibration free. Quality of gearshifts in all is reasonably good too, though the WagonR and Santro feel better than the other by offering slicker shifts. To its advantage the WagonR clutch is the lightest, which makes for minimal stress in traffic. The WagonR and Santro better are close to each other and better the other two cars in terms of drivability in traffic and are in fact stacked very close to each other on the powertrain front. But when it comes to fuel efficiency, the WagonR is the most efficient of the lot courtesy its frugal engine and light weight, followed by the GO, Tiago and Santro in that order. This is where the Tiago's heavy weight turns into an advantage for it. The Tiago XZ+ you see here runs on 15 inch rims shod with slightly wider tyres, which along with the car's weight and well-tuned suspension help it handle better than the other cars here. It feels more confident than the others, either when chucked into corners or doing highway speeds. It also feels more hunkered down as compared to the tall boys, which adds to its more surefooted feel. 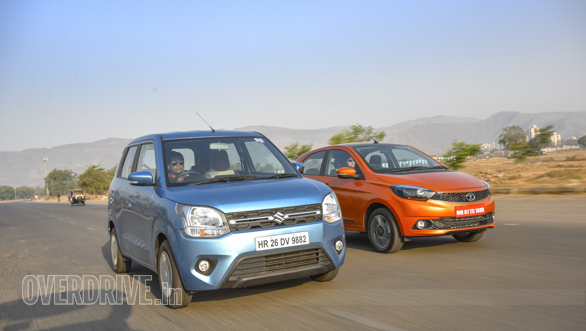 The WagonR and Santro are close again, though it's the Santro that feels better. 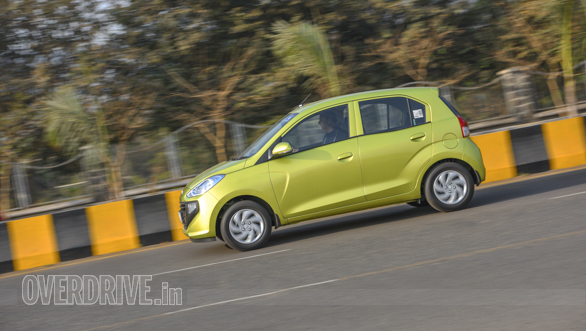 The Hyundai feels more planted and is a more confident handler than the Maruti. 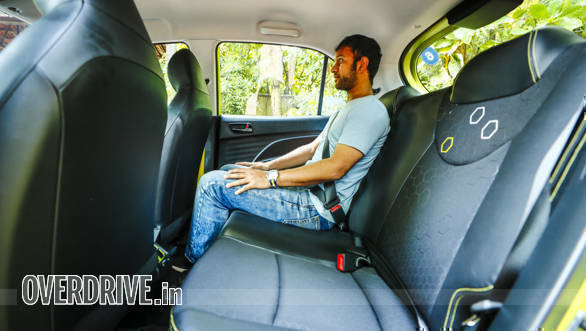 The WagonR feels engaging from behind the wheel and wants you to push, but when you do, feels a tad too light and flighty, unlike the Santro that feels more planted. 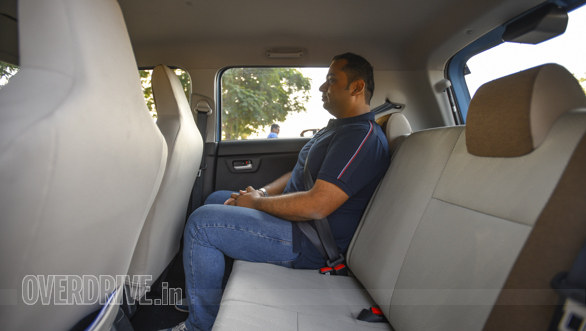 The Santro also has the quietest cabin of all, with minimal road and wind noise as compared to the WagonR, Tiago and GO. The fact that the WagonR is the tallest doesn't help on the handling front and there is some body roll around corners, though with that said, its steering is the best in terms of feedback and the weighted feel. The Datsun GO brings up the rear in the handling department  the car is let down by its tyres which start squealing in protest no sooner than you turn in, though the light weight helps it feel agile. Steering feedback though could have been better. 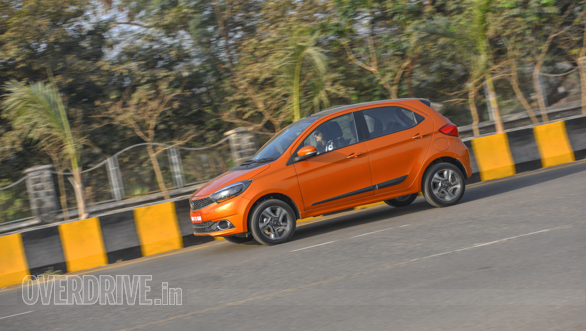 The Tiago's steering also offers good feedback and has a weighted feel though in comparison the Santro's steering lacks the kind of feedback offered by the Tiago and WagonR. The Tiago's ride quality is also very impressive in terms of its ability to soak up bumps and potholes without transmitting shocks to the cabin or any thuds. The WagonR feels as good in terms of absorbing bumps though its flighty feel causes some bit of vertical movement for occupants. The Santro's bump absorption abilities are good, making for good occupant comfort and it offers a well-balanced ride overall. The GO's softer suspension setup helps it soak bumps well making for a good ride quality, though the body roll is an issue around corners. I'm really scratching my head to pick a winner, as this comparison test has turned out to be really close and all four cars impress on various fronts if not all. The Tiago impresses with its ride, handling and solid build but is not as good an overall package as the WagonR or Santro. 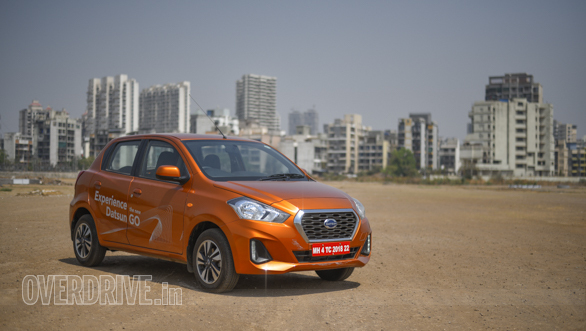 The Datsun GO feels a lot better than before on its own, but still lacks the premium feel of the other cars and falls short of being a compelling package. And that brings me to the two biggies, the WagonR and Santro. Both trade punches in most departments and being newer cars also manage to feel better than the Tiago and GO, especially as an overall package. The Santro as it stands is an excellent product and while it had little trouble winning its last comparison test, falls short of repeating its feat this time by a hair's breadth. It feels as good as the WagonR on a lot of fronts like space, comfort, equipment levels and more, but the WagonR while neck to neck on these fronts, is powered by an engine that's not only significantly more powerful but fuel efficient as well. The WagonR is also the more spacious of the two  making it a better package, while also costing slightly lesser than the Santro. The Santro feels as good as the WagonR overall, but it's the Maruti that's the winner here even if just by a whisker.